It has been an incredible year and the honors just keep on coming. In the latest issue of American Photo magazine my image of B.A.S.E. jumper Jon DeVore (above) was chosen as one of the best images of 2011. It garnered the runner up position for Commercial images in the 2011 Images of the Year section of the magazine. It was one of only 11 images chosen for this years Images of the Year portfolio. I am honored that they would choose one of my images and this one in particular as it was one of the most adventurous shoots I have been on in a while. My thanks to American Photo magazine and the judges for this years Images of the Year portfolio including: Lesley A. Martin, Landon Nordeman, Rick Rickman, Penny de los Santos, Joyce Tenneson and Michael Sand. This is just one more amazing honor that caps off the best year yet of my career. The caption for my image reads: “This photo catches a moment at the top of his jump where Jon is hanging in the air,” says photographer Michael Clark of this shot of Jon DeVore’s BASE jump (for “building, antennae, span and earth”) from a cliff in southwestern Utah. “He is committed and really going for it.” You could say the same of Clark. 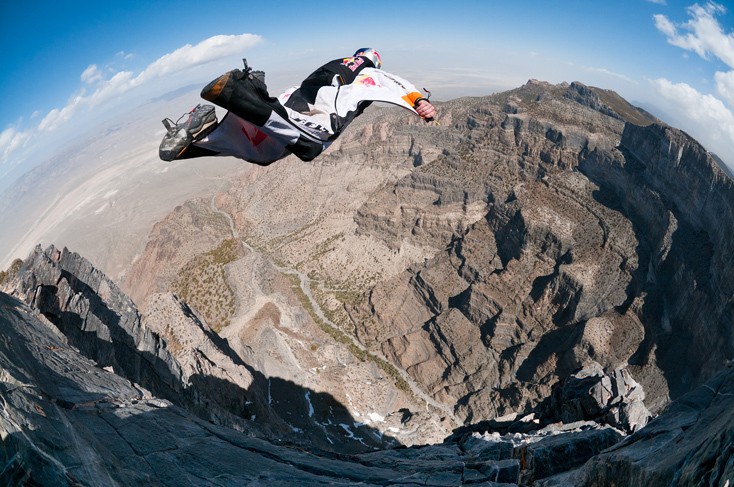 Shooting the Red Bull Air Force jump team was an exercise in limited opportunities. “There were three jumpers, and they only jumped three times apiece,” Clark recalls. “One second after each jump, each one was just a dot in the sky. I had a remote camera set up so that each time, I got about 18 frames total from two different angles.” This was captured at 1/2,000th sec with a Nikon D300 and 10.5mm fisheye lens. See more of Clark’s work at michaelclarkphoto.com. Additionally I have to thank Red Bull, the Red Bull Air Force and Jon DeVore, the B.A.S.E. jumper in this image. Mike Tittel - Congrats Michael! So stoked for you and the year you are having. Keep it up! Michael Clark - Thanks amigo. It has been a wild ride this year! Shawna Bielmann - Wow, Michael!!! Super stoked for you!! !